Fish-Eating Bird Disrupting Food Chain? federally-protected birds were shot last year. For the GLRC, I’m Gregory Warner. Is Goby Die Off Good News? cause the die-off, but initial sampling suggests some kind of disease. other fishes’ eggs and young. 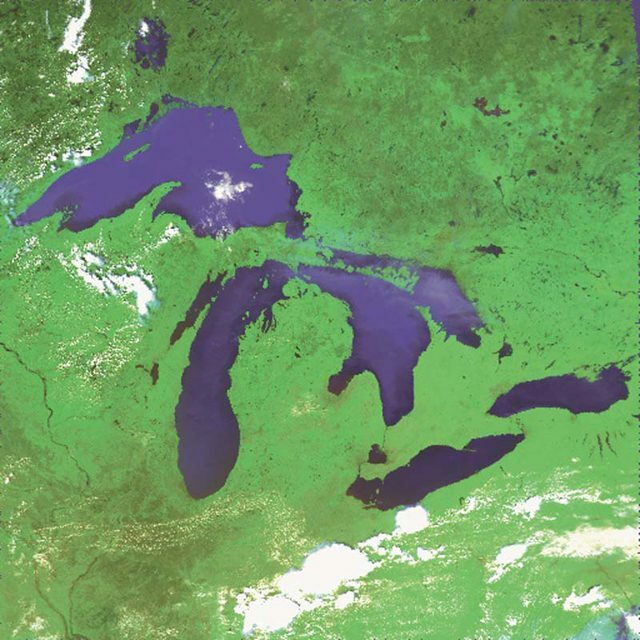 The International Joint Commission and the Government Accountability Office both have been critical of the U.S. government for not finding clear leadership on Great Lakes issues. Different agencies sometimes find their efforts overlap or conflict with others. At times, it seems there’s no organized effort to restore the health of the Great Lakes. Dennis Schornack says he thinks things were starting to get better because recently appointed U.S. Environmental Protection Agency Administrator Mike Leavitt took a real interest in the Great Lakes. But now Leavitt is leaving to become the new Health and Human Services chief. Countless studies and reports on the Great Lakes point out one of the biggest threats to the lakes is invasive species. Those are foreign critters such as zebra mussels and round gobies that hitchhike in the ballast water of cargo ships, or are introduced unintentionally. Often the invasives damage the native fish, plants, and ecosystems of the Great Lakes. Nothing has been done to effectively stop importing the invasives, and some have gone so far as to suggest that the St. Lawrence Seaway connecting the Great Lakes to the Atlantic Ocean should be closed. The IJC’s Dennis Schornack says he’s hopeful that we’ll soon see laws that will do more to help prevent invasive species from getting into the Lakes. Another issue that’s recieved a lot of attention in the Great Lakes region recently is water diversion. A document called Annex 2001 tackles the issue of how much water can be used or withdrawn from the Lakes. The various state governors and province premiers put together draft agreements for public comment. Schornack says there’s been a huge response, and a lot of it hasn’t been positive. Schornack says 2005 will also see some important reports on the economic costs of invasive species. Studies on the logistics of shipping, cargo ship traffic and alternative freight haulers and design plans that look at the total cost of shipping – including the infrastructure costs and the environmental damage caused by invasive species. It should be an interesting year for the Great Lake if Congress moves on key issues, and then finds money to make the Great Lakes more sound. ecosystems work and affected the balance of life in the lakes. Most of them didn’t just wander in. food needed by aquatic animals native to the lakes. Researchers say now these mussels are part of another problem. They’re changing the food web. the process they ingest PCBs and other toxins. within Lake Erie – a chain that can connect harmful chemicals buried in lake mud to humans. the arrival of the round goby, which likes to eat zebra mussels, would seem to be good news. Instead, it has proven to be a double-edged sword. mussels, and then the zebras are eaten by the round goby. choose between several types of prey, including gobies, emerald shiners, and crayfish. more gobies were consumed than any other prey. Roy Stein says that this puts the system in a kind of double jeopardy. for expectant mothers and other health problems. native species have had a similar impact on PCB transfer from Lake Michigan sediment. that the implications are far-reaching. of a much larger concern: the overall health of the environment. For the Great Lakes Radio Consortium, I’m Carolyn Gramling. Fish such as bass, trout, and walleye normally eat small native fish. a lot of pollutants like PCBs. been studying fish living near polluted areas. populations where they’ve become a problem.